Leviticus 4 (NLT) – Then the Lord said to Moses, “Give the following instructions to the people of Israel. This is how you are to deal with those who sin unintentionally by doing anything that violates one of the Lord’s commands. “If the high priest sins, bringing guilt upon the entire community, he must give a sin offering for the sin he has committed. He must present to the Lord a young bull with no defects. He must bring the bull to the Lord at the entrance of the Tabernacle, lay his hand on the bull’s head, and slaughter it before the Lord. The high priest will then take some of the bull’s blood into the Tabernacle, dip his finger in the blood, and sprinkle it seven times before the Lord in front of the inner curtain of the sanctuary. The priest will then put some of the blood on the horns of the altar for fragrant incense that stands in the Lord’s presence inside the Tabernacle. He will pour out the rest of the bull’s blood at the base of the altar for burnt offerings at the entrance of the Tabernacle. Then the priest must remove all the fat of the bull to be offered as a sin offering. This includes all the fat around the internal organs, the two kidneys and the fat around them near the loins, and the long lobe of the liver. He must remove these along with the kidneys, just as he does with cattle offered as a peace offering, and burn them on the altar of burnt offerings. But he must take whatever is left of the bull—its hide, meat, head, legs, internal organs, and dung— and carry it away to a place outside the camp that is ceremonially clean, the place where the ashes are dumped. There, on the ash heap, he will burn it on a wood fire. “If the entire Israelite community sins by violating one of the Lord’s commands, but the people don’t realize it, they are still guilty. When they become aware of their sin, the people must bring a young bull as an offering for their sin and present it before the Tabernacle. The elders of the community must then lay their hands on the bull’s head and slaughter it before the Lord. The high priest will then take some of the bull’s blood into the Tabernacle, dip his finger in the blood, and sprinkle it seven times before the Lord in front of the inner curtain. He will then put some of the blood on the horns of the altar for fragrant incense that stands in the Lord’s presence inside the Tabernacle. He will pour out the rest of the blood at the base of the altar for burnt offerings at the entrance of the Tabernacle. 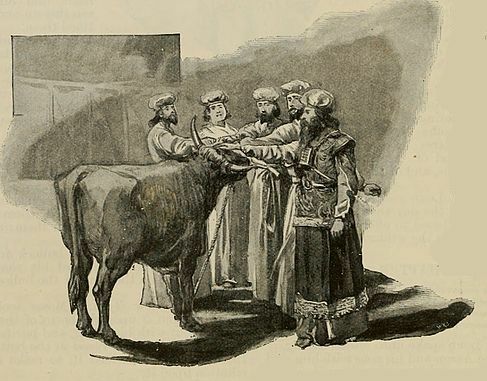 Then the priest must remove all the animal’s fat and burn it on the altar, just as he does with the bull offered as a sin offering for the high priest. Through this process, the priest will purify the people, making them right with the Lord, and they will be forgiven. Then the priest must take what is left of the bull and carry it outside the camp and burn it there, just as is done with the sin offering for the high priest. This offering is for the sin of the entire congregation of Israel. “If one of Israel’s leaders sins by violating one of the commands of the Lord his God but doesn’t realize it, he is still guilty. When he becomes aware of his sin, he must bring as his offering a male goat with no defects. He must lay his hand on the goat’s head and slaughter it at the place where burnt offerings are slaughtered before the Lord. This is an offering for his sin. Then the priest will dip his finger in the blood of the sin offering and put it on the horns of the altar for burnt offerings. He will pour out the rest of the blood at the base of the altar. Then he must burn all the goat’s fat on the altar, just as he does with the peace offering. Through this process, the priest will purify the leader from his sin, making him right with the Lord, and he will be forgiven. “If any of the common people sin by violating one of the Lord’s commands, but they don’t realize it, they are still guilty. When they become aware of their sin, they must bring as an offering for their sin a female goat with no defects. They must lay a hand on the head of the sin offering and slaughter it at the place where burnt offerings are slaughtered. Then the priest will dip his finger in the blood and put it on the horns of the altar for burnt offerings. He will pour out the rest of the blood at the base of the altar. Then he must remove all the goat’s fat, just as he does with the fat of the peace offering. He will burn the fat on the altar, and it will be a pleasing aroma to the Lord. Through this process, the priest will purify the people, making them right with the Lord, and they will be forgiven. “If the people bring a sheep as their sin offering, it must be a female with no defects. They must lay a hand on the head of the sin offering and slaughter it at the place where burnt offerings are slaughtered. Then the priest will dip his finger in the blood of the sin offering and put it on the horns of the altar for burnt offerings. He will pour out the rest of the blood at the base of the altar. Then he must remove all the sheep’s fat, just as he does with the fat of a sheep presented as a peace offering. He will burn the fat on the altar on top of the special gifts presented to the Lord. Through this process, the priest will purify the people from their sin, making them right with the Lord, and they will be forgiven. Leviticus 5 (NLT) – “If you are called to testify about something you have seen or that you know about, it is sinful to refuse to testify, and you will be punished for your sin. “Or suppose you unknowingly touch something that is ceremonially unclean, such as the carcass of an unclean animal. When you realize what you have done, you must admit your defilement and your guilt. This is true whether it is a wild animal, a domestic animal, or an animal that scurries along the ground. “Or suppose you unknowingly touch something that makes a person unclean. When you realize what you have done, you must admit your guilt. “Or suppose you make a foolish vow of any kind, whether its purpose is for good or for bad. When you realize its foolishness, you must admit your guilt. 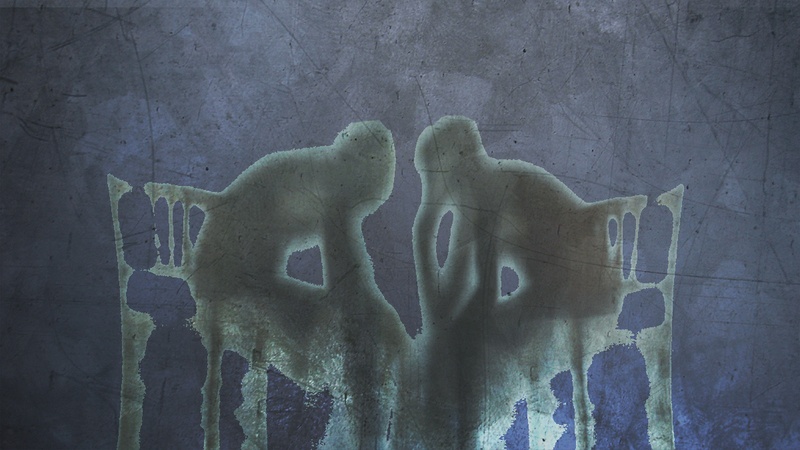 “When you become aware of your guilt in any of these ways, you must confess your sin. Then you must bring to the Lord as the penalty for your sin a female from the flock, either a sheep or a goat. This is a sin offering with which the priest will purify you from your sin, making you right with the Lord. “But if you cannot afford to bring a sheep, you may bring to the Lord two turtledoves or two young pigeons as the penalty for your sin. 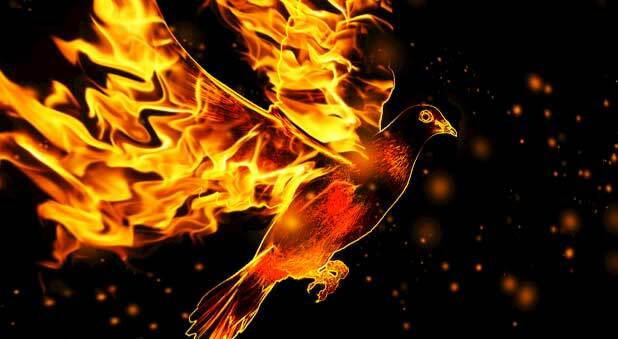 One of the birds will be for a sin offering, and the other for a burnt offering. You must bring them to the priest, who will present the first bird as the sin offering. He will wring its neck but without severing its head from the body. Then he will sprinkle some of the blood of the sin offering against the sides of the altar, and the rest of the blood will be drained out at the base of the altar. This is an offering for sin. The priest will then prepare the second bird as a burnt offering, following all the procedures that have been prescribed. Through this process the priest will purify you from your sin, making you right with the Lord, and you will be forgiven. Then the Lord said to Moses, “If one of you commits a sin by unintentionally defiling the Lord’s sacred property, you must bring a guilt offering to the Lord. The offering must be your own ram with no defects, or you may buy one of equal value with silver, as measured by the weight of the sanctuary shekel. You must make restitution for the sacred property you have harmed by paying for the loss, plus an additional 20 percent. When you give the payment to the priest, he will purify you with the ram sacrificed as a guilt offering, making you right with the Lord, and you will be forgiven. Then the Lord said to Moses, “Give Aaron and his sons the following instructions regarding the burnt offering. The burnt offering must be left on top of the altar until the next morning, and the fire on the altar must be kept burning all night. 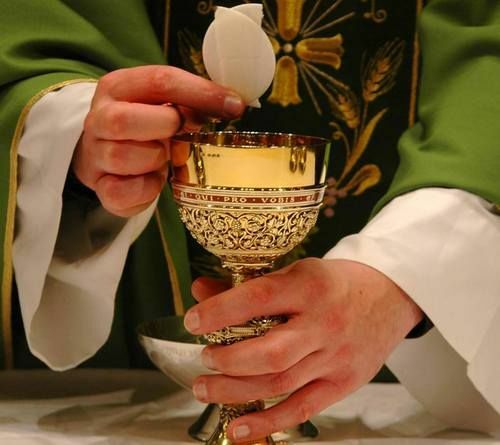 In the morning, after the priest on duty has put on his official linen clothing and linen undergarments, he must clean out the ashes of the burnt offering and put them beside the altar. Then he must take off these garments, change back into his regular clothes, and carry the ashes outside the camp to a place that is ceremonially clean. Meanwhile, the fire on the altar must be kept burning; it must never go out. Each morning the priest will add fresh wood to the fire and arrange the burnt offering on it. He will then burn the fat of the peace offerings on it. Remember, the fire must be kept burning on the altar at all times. It must never go out. Then the Lord said to Moses, “Give Aaron and his sons the following instructions regarding the sin offering. The animal given as an offering for sin is a most holy offering, and it must be slaughtered in the Lord’s presence at the place where the burnt offerings are slaughtered. The priest who offers the sacrifice as a sin offering must eat his portion in a sacred place within the courtyard of the Tabernacle. Anyone or anything that touches the sacrificial meat will become holy. If any of the sacrificial blood spatters on a person’s clothing, the soiled garment must be washed in a sacred place. If a clay pot is used to boil the sacrificial meat, it must then be broken. If a bronze pot is used, it must be scoured and thoroughly rinsed with water. Any male from a priest’s family may eat from this offering; it is most holy. But the offering for sin may not be eaten if its blood was brought into the Tabernacle as an offering for purification in the Holy Place. It must be completely burned with fire.